Point of Sales is designed to help companies to combine their sales procedures and tasks, starting with leads and quotes and moving to conversions, along with reports and quality evaluation. This product can collect vital sales info in a short amount of time and you don’t have to spend hours doing the same work by hand on a spreadsheet. POS can give you a detailed picture of your sales team’s work on different products, services, locations, and customers. This solution can accelerate the tracking of your sales flow to help you achieve your targets faster. 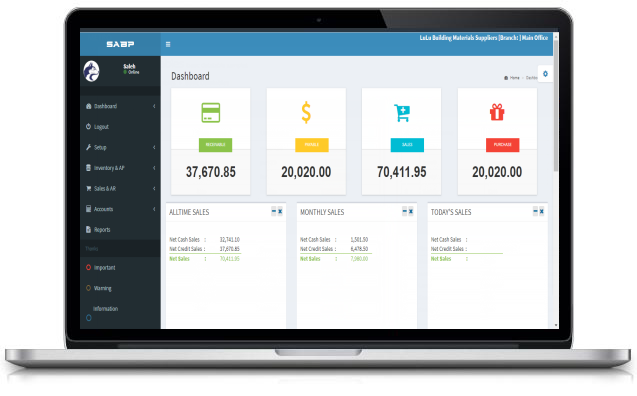 SABP ERP software provided ‘’Sales Order’’, ‘’Quotation’’, ‘’Delivery Note’’, ‘’Cash & Credit sales invoice’’, ‘’Receipt Voucher” etc. It has reported daily, weekly and monthly cash and credit sales value, cash collection, cash in custody, accounts receivable, and payment due date, aging report, unpaid, paid and partial paid invoices and more. Also Track profit, profit ratio and margin from each invoice and each items.